In 1656 Oliver Cromwell ended the exclusion of Jews from England and Wales which had begun in 1290. Although they were subsequently treated as second-class citizens, many Jews fled to London to escape much worse persecution in Eastern Europe and on the Iberian Peninsula. By the beginning of the eighteenth century there was a growing, if divided, Jewish community, and over the course of the next two hundred years that community grew to encompass around 140,000 individuals. 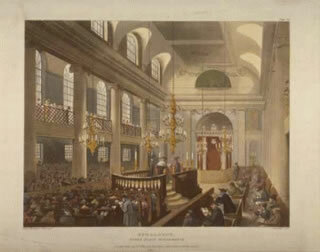 Sephardi Jews, primarily from the Iberian Peninsula but including some second generation emigrants from Central and Western Europe as well, were the first to settle in London, establishing a synagogue and a burial ground. They originally came to flee the Spanish Inquisition, but later emigrated to escape poverty. This group of Jews assimilated quickly into British society, being accustomed both to hiding their Jewish identity and to interacting with non-Jewish communities. Wealthy Jews could easily interact with Christians because of their economic situation. Intermarriage and conversion were common in London, and were attractive because they offered access and membership to British institutions. 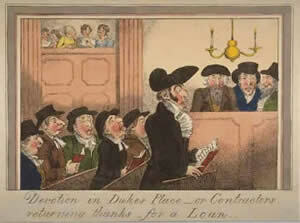 During the eighteenth century receiving a University education, gaining a place at the Inns of Court, and obtaining a seat in Parliament were all denied to non-Anglicans. Jewish old clothes dealers (c.1800). Ashkenazi Jews came to London fleeing religious persecution and often arrived from Central and Eastern Europe propertyless and poor. This fast-growing group assimilated with gentile Londoners at a slower rate than the Sephardim. Many Ashkenazim (and the poorer Sephardim as well) found jobs as small-time street vendors, hawking second-hand goods, clothes, fruit, sealing wax, etc., and were an extremely visible component of London street life. Jewish street vendors were particularly associated with the used clothing market known as "Rag Fair". They built the "Great Synagogue" in Aldgate in 1697. Most people identified all Jews with the Ashkenazi, and it is the image of the poor Jewish street trader that formed the basis for anti-Semitic stereotypes. Jewish street traders have a significant presence in the Proceedings, frequently being accused of handling stolen goods. They also appear as victims of many crimes, and in some trials their accents and grammar are transcribed phonetically. By 1800 the vast majority of London’s 20,000 strong Jewish population were Ashkenazi. Through the first half of the nineteenth century, the Jewish Communities of London grew slowly, both consolidating their position within the clothing and rag trades and having a substantial impact on banking and financial services. It was during the first half of the nineteenth century that wealthy individuals and families such as the Rothchilds came to prominence. Although inter-communal conflict and anti-Semitism continued, there was also a high level of assimilation, particularly within the middling classes and elite. The late eighteenth and early nineteenth centuries also saw the development of a significant number of Jewish institutions, including the Board of Deputies, established in 1760, and the Jewish Board of Guardians, in 1859. 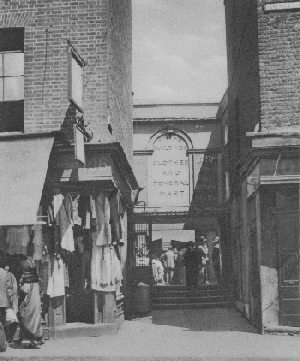 A used clothing store in Houndsditch, from St. John Adcock, Wonderful London (1926/7), vol. II, p.797. In the second half of the nineteenth century, in response to the Russian famine of 1869-70 and the threat of conscription during the Russo-Turkish war of 1875-6, a new wave of poorer Eastern European and primarily Russian Jews arrived in London. These immigrants were then followed by many more driven from the Russian Empire and Prussia in the early 1880s and 1890s by pogroms and anti-Jewish agitation. The 1901 census records that there were 53,500 Poles and Russians, almost entirely Jewish, living in London, and around 140,000 Jews in total. This new population allowed the creation of an ever more vibrant Jewish community, centred on the East End of London. Jewish theatre and newspapers, including the Jewish Chronicle established in 1841, flourished, as did synagogues, Jewish trade unions and hebrot – the religious associations of which Beatrice Potter thought she could count thirty or forty in the East End alone in1887. Before 1753 Jews were not allowed to become legally British. In that year "The Jew Bill", designed to prevent rich, foreign-born Jews from being discriminated against, began to ameliorate this situation for at least the wealthiest in the community. Jews were not granted substantial rights, however, until 1858, with the passage of the Jewish Relief Act. Lionel Rothchild became the first religious Jew to serve in the House of Commons when he took his seat the following April. Of perhaps more practical legal importance were the continuing efforts made by the City of London and Westminster to regulate the hawking and peddling trades in which poorer Jews made a living. Levels of migration were severely limited following the passage of the Alien Immigration Act of 1905. Searching on the word interpreter or translator will bring up large numbers of trials involving foreign witnesses and defendants.